Part of semi-final action between Sparta Boss and North Ruimveldt on Tuesday evening at the National Cultural Centre Tarmac. 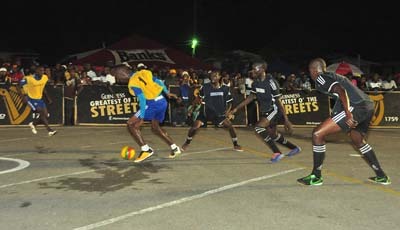 holding their nerves in the penalty shootout to boot favourites Leopold Street and Sparta Boss out of championship contention when semi-final action in the Georgetown Zone of the Guinness ‘Greatest of de Streets’ Futsal Competition ended on Tuesday evening, at the National Cultural Centre Tarmac. Appearing in the first semi-final in front of another large turnout, Festival City Warriors led by Eon Alleyne, Solomon Austin and Daniel Favourite proved more than a handful for former champions Leopold Street who they held to a goalless draw in regulation and extra time, before edging them 1-0 in the penalty shootout. Leopold Street’s O’kanie Fraser signaled his intentions as early as the opening minute when he let fly a ripper that sailed marginally outside the upright. However, Alleyne and company never looked overawed and mounted a few incursions of their own, but competent defending kept the contest even. Fraser urged his team on, but even the usually silky skills of Omallo Williams, who showed flashes of brilliance could not penetrate the brickwall defence that the Warriors constructed and the teams went to the break levelled at nil-all. On the resumption, both teams treated the fans to some enchanting football with Fraser and Williams combining beautifully, while Alleyne and Favourite dazzled with their interchanges, but in the end no goals materialised even in the allotted extra time. The final result saw the Warriors squeeze home following a solitary penalty strike after some luckless shooting. In the other game, previously unbeaten Sparta Boss was frustrated by a well organised North Ruimveldt unit and went down 2-1 on penalty kicks after regulation and extra time failed to detach a nil-all stalemate. Sparta Boss, with their leading goalscorers Devon Millington and Sheldon Shepherd in the side, stumbled into a rock solid defence marshalled expertly by the experienced Gerald Gritten and failed to breach the goal despite both teams creating several opportunities. Gritten was a tower of strength at the back, while his counterpart Jerome Richardson was equally impressive forcing the game into a shootout to arrive at a winner. North Ruimveldt is an excellent penalty shooting team, while Sparta Boss, a two-time Mackeson ‘Keep Your Five Alive’ champions were never tested prior to the matchup. Millington was substituted shortly before the final whistle sounded and this came as a shock to many of their supporters. North Ruimveldt who scored their first and last spot kick outlasted their opponents to enter the championship game and spark wild celebrations among their supporters. Both North Ruimveldt and Festival City Warriors will battle Sunday night at the National Park with the winner set to take home $500,000 and the winning trophy to go with a place in the national playoffs set for next year. The runner-up will pocket $300,000 and a trophy and a place in the national playoffs, while Sparta Boss and Leopold Street will meet in the third place playoff for $200,000 with the loser guaranteed $100,000. Meanwhile, the Skills Challenge is ongoing for a top prize of $20,000, while a Fair Play Award of $50,000 has been introduced in this year’s edition.